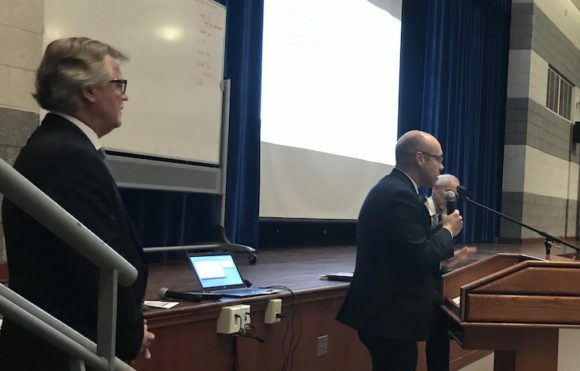 Over 100 people turned out for an Education and Regionalization Forum at Old Saybrook Middle School on Thursday, April 11. The event was hosted by Rep. Devin Carney, (R-23rd), with Senators Paul Formica, (R-20th), and Norm Needleman, (D-33rd). While the two parties differ on Connecticut road tolls, all three local officials said they are against forced regionalization of school district bills proposed by Senate President Pro Tempore Martin Looney, Senators Bob Duff and Cathy Osten, Deputy President Pro Tempore, and by Governor Ned Lamont. 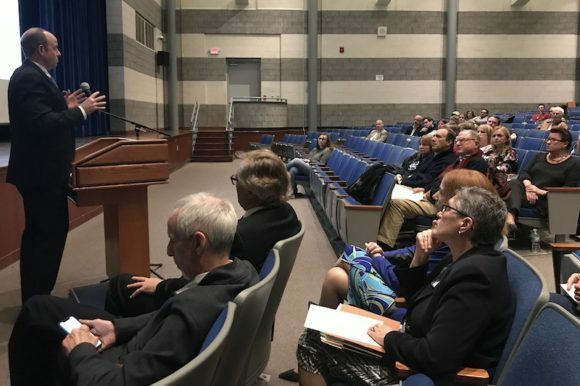 Rep. Carney said there was an enormous public outcry by small towns and school districts, thousands of pieces of testimony received and hundreds of people, including students from Region 18 schools, who testified in March hearings. While this probably means that the idea of aligning school districts with recently consolidated probate districts is not advancing, the matter of reducing and reallocating education costs is very much still alive, and pieces of proposed legislation could still become law. “Nothing is truly ever dead until we gavel out at midnight on June 5,” Rep. Carney said, explaining the state legislative process and timelines of the ongoing session in Hartford. State Rep. Devin Carney (R-23rd) addresses the audience Monday night while (left) State Sen. Paul Formica (R-20th) awaits his turn to speak. Almost hidden from view, State Sen. Norm Needleman (D-33rd) stands to Rep. Carney’s right. SB 1069, proposed by Sen. Needleman, which allows the DOE to study the effects of towns working together as Local Education Agencies, is intended to encourage voluntary regional cooperation and maximize efficiencies and cost savings without being mandated to become regional school districts. Superintendents Ian Neviaser (Lyme-Old Lyme), Jan Perruccio (Old Saybrook), and Pat Ciccone (Westbrook) addressed how their districts have been sharing services and resources to reduce costs while maintaining the quality of curriculum along with educational, extracurricular and sports activities and programs. Standard practices include health and dental insurance, energy, financial software, food service and supplies, plus student transportation for specialized programs. Old Saybrook, Westbrook and Region 4 (Chester, Deep River and Essex plus the three elementary schools for each of those towns, which are not part of Region 4) school districts already share staff, Perruccio said, in an arrangement that has the flexibility to change yearly based on each districts’ demographic needs. Perruccio said she was alarmed that the forced regionalization bills showed a lack of regard and understanding of how school districts are already sharing resources with a focus on quality of education. Ciccone cited how the districts are coordinating to provide professional development for their teachers, and how Westbrook’s school facilities, sports programs and fields are utilized by the Town Parks and Recreation Department and local YMCA. The schools and town share legal and financial services support, as well. Lyme-Old Lyme Schools Superintendent Ian Neviaser stands at the podium during Monday evening’s forum. “There is a money issue here, we need to be frank about it,” said Neviaser, pointing out that significant redistribution of wealth from school districts with higher property values and tax base already occurs. Fifty-one percent of New London’s school budget is paid by the state, he said., as is over 60 percent of Norwich’s, 33 percent of Montville’s and 14 percent of East Lyme’s school budgets. Meanwhile, Lyme-Old Lyme Schools receive less than one percent of operating expenses from the state. When asked if they moved to their town because of the quality of the schools, a high number of people in the audience raised their hands. While the majority of questions and comments addressed specifics of proposed legislation, the overarching issue of state fiscal problems and how to address government spending arose. 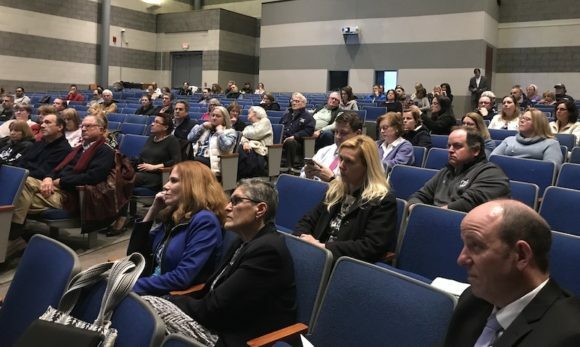 Lyme and Old Lyme residents were some of the most vocal about the impact of proposed legislation on property values, taxes and the quality of local school districts. The legislators encouraged voters to speak up, write letters, follow grassroots organizations such as Hands Off Our Schools or form their own group to express concerns to elected officials.